India invariably witnesses a thriving demand for traditional sweets, especially in the latter half of the year, due to a lot of national and regional festivals celebrated across the country. Though, the rituals of the festivals may vary, one thing that has remained unchanged is savoring sweets. The taste for the old age mithais(sweets) like Kaju Katri, Barfi, Gazak, Rosogulla, etc. amongst the sweet-toothed Indians has never changed. The Indian sweet industry is growing at a rate of 16% each year (twice India’s growth rate) and is one of the largest markets. The Branded segment is growing even faster at 25% as quality and brand consciousness amongst consumers grows. Except for a few branded players like Haldiram, Ananda, Bikaner sweets, and Place of Origin, most sweet outlets are family-run businesses. This produces a great opportunity to start an online branded sweets outlet. Just as establishing any business requires strategy, building a successful branded online store needs some planning beforehand. There are four important factors specific to this segment that need to be knuckled down. While selling sweets online, the most important factor that should be addressed before any other, is shipping. Shipping is the deal breaker for this business, as the items are perishable with relatively shorter shelf life; e.g. milk-based sweets. Offering flexible shipping options like local delivery, pick-up options, and same day delivery will handle this issue efficiently. Trust is also one of the important factors that influences the buying decision. Food safety will be the primary concern amongst consumers if you start up without any goodwill and reputation. To create trust amongst your target audience, ask for product reviews and ratings on the product pages of your website. Reviews are a social proof for other consumers who are planning to buy your items. You can also reward your customer for every review they post. This will certainly instill trust into your consumers, which will help in building a reliable brand. Choosing the right audience for your offerings is equally as important as any other factor; it helps to channelize your marketing efforts in the right direction. Word of mouth and other traditional media like pamphlets may work, but only to an extent. 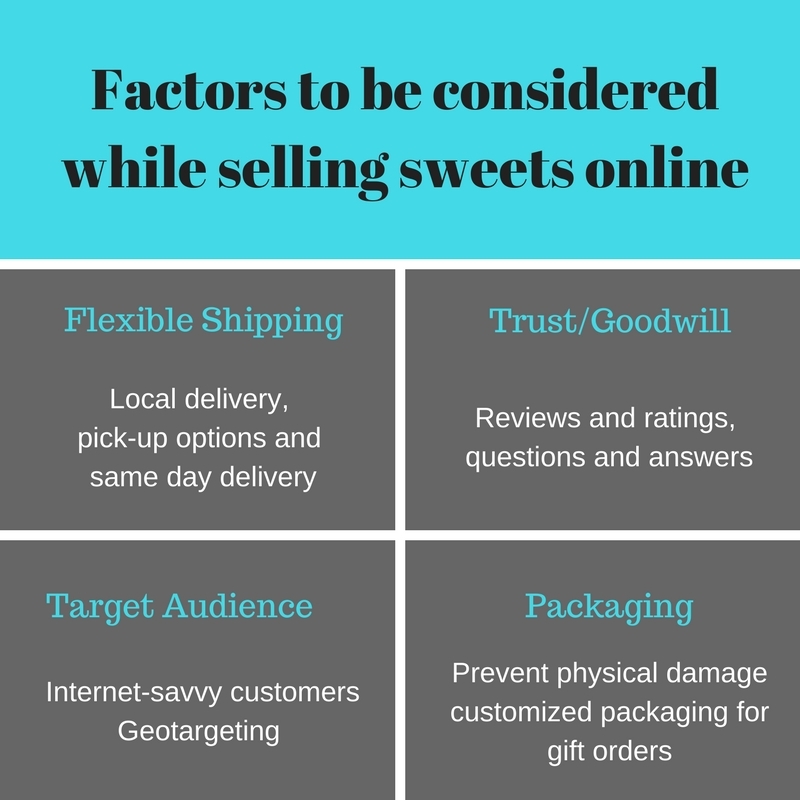 Due to the special shipping requirements of selling sweets online, you may want to target local or nearby customers. For this, you can use geo-targeting. Geo-targeting is a non-traditional and cost-effective advertising practice designed to target a specific geographical location with potential buyers. It will allow your store’s ad to appear more in the chosen geographical area for relevant searches. Choose a radius of 10KMs or 20KMs (as much as you want, unless shipping and delivery are not an issue) with significant population. This will help you find the right customers and give you the best ROI. You can limit your ads till the time you feel that you have a large customer base, or when you start receiving plenty of orders organically. On the lines of food safety, packaging is another important factor while selling sweets online. Well-packed orders not only prevent physical damage of food items, but also delight customers who are intending to gift to their loved ones. You can offer customized packaging for gift orders. 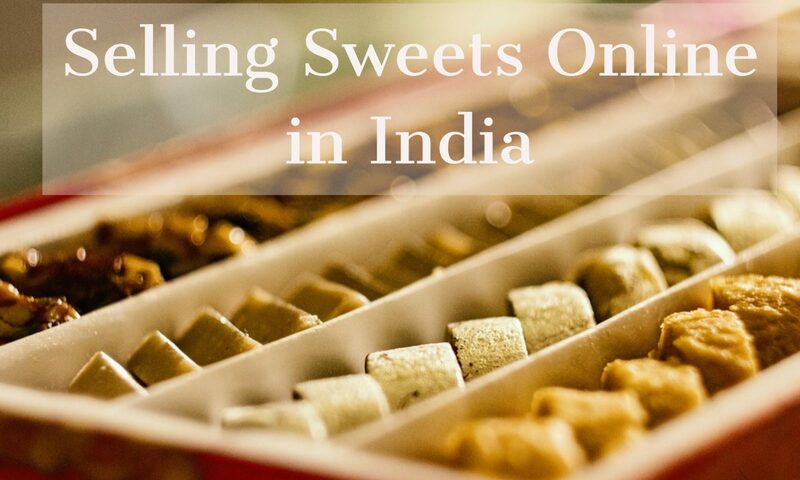 How to start selling sweets online in India? You can easily take your local sweet outlet online with ShopShastra. It offers all the necessary features you need to run a successful online sweet store. • Build a brand for your local store by creating an ecommerce website under your own domain. • Upload as many items as you have to offer, with their pictures, descriptions, shelf-life, quantity, and prices. • Offer multiple shipping options like pick up, local delivery, and same day delivery. • Besides accepting payments through debit and credit cards, offer cash-on-delivery option to your customers who do not have a means of online payment. Once you are done setting up your store for selling sweets online, start promoting it on social media platforms. Spread the word around by advertising your store on packaging materials even while still selling offline. Offer discounts to your customers on their first purchase. Doing all this will help you get traffic to your online store and generate more sales. In addition to offering your existing sweet products, begin selling sugar-free sweet items, because, lately, sugar-free sweets have become the mantra for diabetic and health-conscious consumers. And since consuming artificial sweeteners is a big no-no for diabetic patients, substituting sugars and artificial sweeteners with healthier options like honey establishes a wider audience for your business.